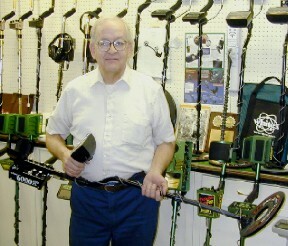 Hello, my name is Donald Hinks and I operated Gettysburg Electronics for over 45 years. My own treasure hunting career began in the late '60s with an early BFO / Transistor Radio kit. After graduating to an early Heathkit, I (and my kids) were hooked, and since 1972 we provided the best brands of world-class metal detectors as a full service dealer in historic Gettysburg, Pennsylvania. At the end of November, 2017, my wife and I, over 85 years old, reached the point where we had to retire from the business. We appreciate each customer who entered the store, and thank them for their business. We have become close friends with many people over the years. We will miss them.